Take your garage from basic to man cave. 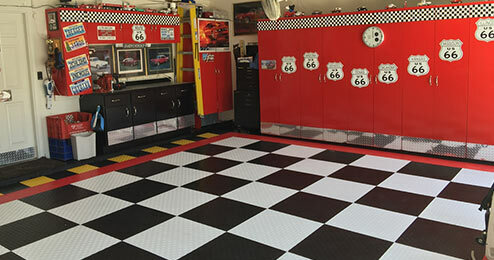 We’ll teach you how to create your dream garage, from everything from garage flooring to decor. 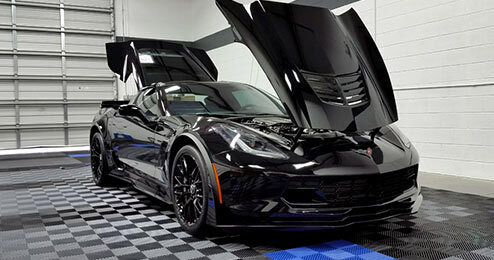 For most of us, our dream home is not complete until we finish our dream garage. Sometimes forgotten, the garage is one of the most important rooms in the house. A decked out garage is great for entertaining, having a place to work, hobbies/collecting and it even ups the resale value on your house. Creating a garage space that does more than protect your car can be overwhelming. There’s floors and doors. The list goes on. Don’t worry; we’re gonna break it down for you and take you through this process step by step. With any big project, you don’t want to dive in head first. It’s important to look around, spend some time just gawking at all the incredible garages out there and then start planning. Don’t know where to start brainstorming? I’ve got excellent news for you. Brainstorming and searching for inspiration has never been easier. In fact, you don’t even need to leave the house. For the ladies, I’m sure you’ve already started your Pinterest board. For the gentlemen, don’t be afraid to get on Pinterest – I promise not to take away your man card. Websites like Pinterest, Houzz, Instagram, blogs and even Google Images make searching for inspiration ridiculously simple and accessible. And don’t forget – there’s inspiration all around: TV, movies, friends and family’s homes, basically everywhere you go! Just because you’re “supposed” to park your car in your garage, doesn’t mean that’s how you have to use it! And think about it, you’re not going to need the same things for a garage gym as an auto workspace. It’s easy to get pigeonholed into traditional or common garage uses, but honestly, the possibilities are endless. For example, you could create a library, entertainment room, playroom and more. If there’s a room or space you want in your house, you can create it in your garage! This goes along with what you’ll be using your garage for. That’s why you want to choose that first. Because if you choose a fried chicken theme, that could be kind of weird in a garage gym, but you do you. In your brainstorming and inspiration, you will probably find lots of ideas for fun, unique garage themes. Or, if you have a hobby or passion, there might be a great idea in that. I would totally be the girl with the CrossFit garage gym because that’s my jam. Think about the things you love, what you’ll be doing there and how the theme will play into your time in the garage. The possibilities are endless with everything from man cave to classic vintage, race cars, arcade and more. There is something for everyone! 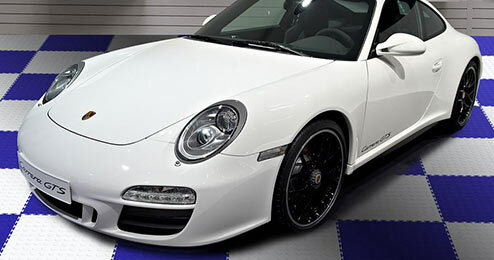 Before you start bringing all the stuff into your garage, you want to make sure it matches. Okay, maybe you don’t want to make sure it matches but, chances are, someone in your home does legitimately care about things matching. You don’t have to go with a solid color. In fact, everything in just one color is not something I would recommend. However, you want to decide on a couple complementary colors that you’ll be using. If you plan to paint, this is the time to pick those colors. If you’re adding garage flooring and storage, you want to make sure those match as well. Basically, what you don’t want is to get everything in at the end and be like “Oh s$@#! None of this matches!” A little pre planning will save you a big headache in the long run. This is our favorite part! Surprised, party of zero. Honestly though, the floor really does set the tone for the entire space. 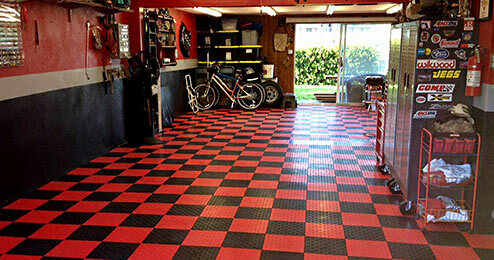 We recommend sticking with garage floor tiles, garage flooring rolls or an epoxy floor coating. Of course, if you’re going for a garage gym or home theater , you’re going to want something totally different so be sure to keep that in mind. 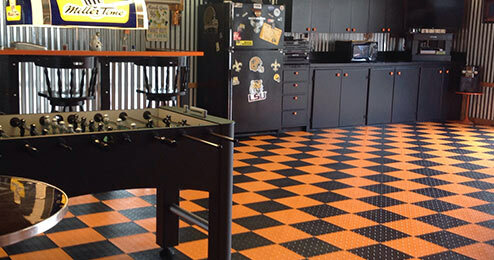 In our garage flooring guide, we’ll go more in-depth about which floors are best for which themes and uses. Once you’ve decided on your floor type, think about those colors you chose. 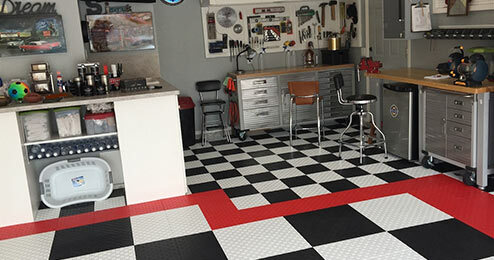 With garage tiles, you have the option to create patterns (think checkerboard, squares or custom patterns). You can always go simple and understated, too. The best thing to do is order a few samples and look at them in your garage (ideally with the lighting the way it will be once it’s finished). Check them out and see what you like. You may even surprise yourself with your choice. Again, this depends on how you plan to use your garage. If you’re going to be working on cars or any building, woodworking, etc., you need a place to put all your tools. And the answer is not the kitchen counter. Same goes for craft spaces and home theaters – where are you going to put all those beads and movies (although, does anyone actually buy physical DVDs anymore? Or has Netflix taken over??). Think about what you’re going to be storing, your color scheme and how secure the storage needs to be. 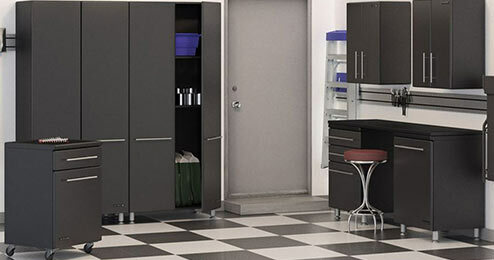 There are lots of garage storage and shelving options available. However, if you just need something small, there are lots of fun DIY garage storage solutions as well. 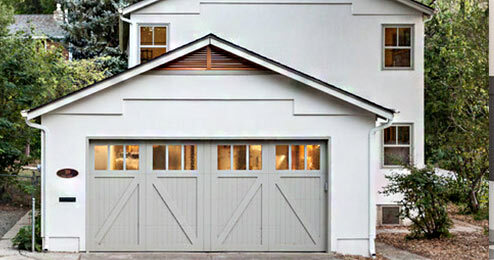 There’s a lot more to a garage door than curb appeal. I mean, that’s important too, of course. But there’s a lot more going on that you’ll need to consider. Number one is safety. Most garage doors today come stocked with safety features that make it nearly impossible for any accidents to happen, but some have better (and more reliable) specs than other. Check them out. Especially if you have kids. Garage doors also come with loads of cool features these days and (most of the time) these features are controlled by your garage door opener rather than the garage door. The bare bones options are timers and garage codes, but once you get into the bigger deal things, you’ll find there are more features available than you ever imagined. “Decor” doesn’t have to mean a bunch of knick-knacks from Hobby Lobby. This can mean neon signs for your 1950’s garage or race car posters – whatever you want! If you’re going for a specific theme, you’ll probably find that just the basics won’t cut it. You need to spruce things up a bit and gather some art, posters, collectibles, etc. that fit your vision. Personally, I don’t recommend spending a ton on this. You can find cheap stuff online, at Goodwill, yard sales, etc. You totally can go big and order exactly what you want, but if that’s not in your budget, you can still have a sweet looking garage. So, I live in Phoenix. It is freakin’ hot here and ain’t nobody hanging out in an uninsulated, unairconditioned garage in July when it’s 115 degrees. Ew. Also, if you live in Canada, you probably want to stay warm through those winter months (January – December, right?). The deal is you want any type of living or working space to be temperate, That’s why we have things like AC. You have a few options if you’re not lucky enough to live on the California coast where it’s 60-70 degrees year round. You can use insulation to keep your garage temperate or install a dedicated heating/air conditioning system. The heat and air will run up your electricity bill a bit, but unless you have an enormous garage, it is probably doable. Also, if you have an 11 car garage, I’m just guessing, but maybe your electric bill is not as big of a deciding factor. 10. Any Bells & Whistles? These are your specialty things. Lifts, rigs, special equipment for whatever theme/use you’ve chosen. Now, these are totally not mandatory. In fact, how many people really need a lift in their garage? But some people want one so we’re just reminding you to consider these things too. *Note: Be sure any heavy specialty equipment you choose is compatible with your floor before ordering either one.